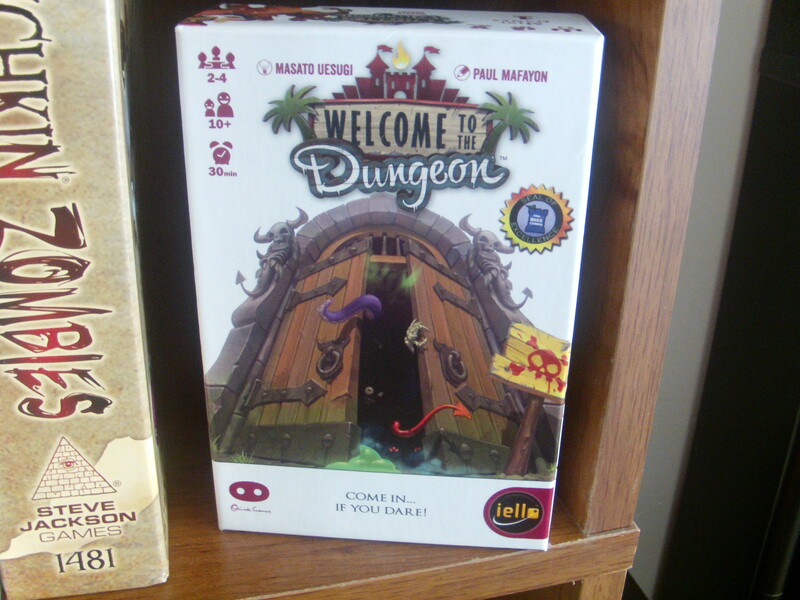 Welcome to The Dungeon is a bluffing game of the “press your luck” variety published by Iello for 2-4 players with games averaging about 30 minutes each. In this game, players will be daring each other to take adventurers into increasingly more difficult dungeons with less and less equipment. 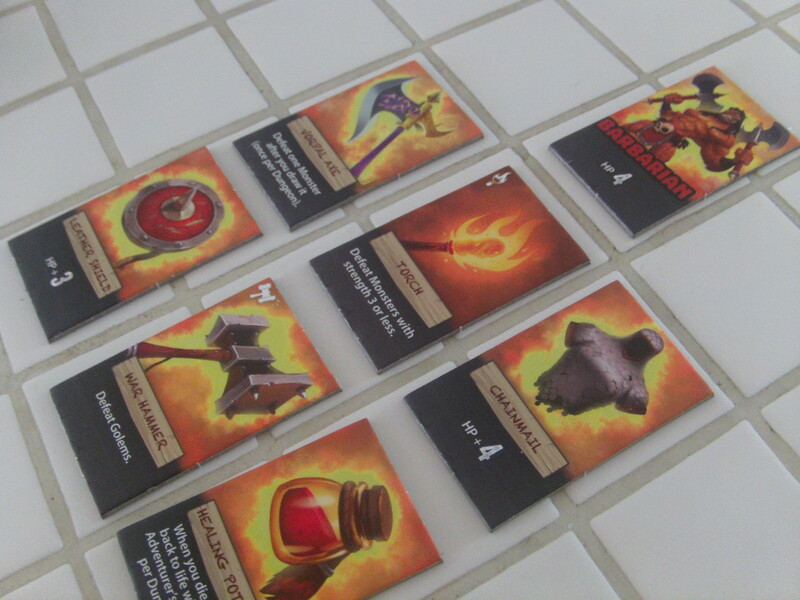 At the start of each round an adventurer (Either a Barbarian, Rogue, Mage, or Warrior) with their own selection of equipment is placed in the center of the table. On their turn, a player can do one of two things. They can either pass (and sit out the rest of the round) or take a card. 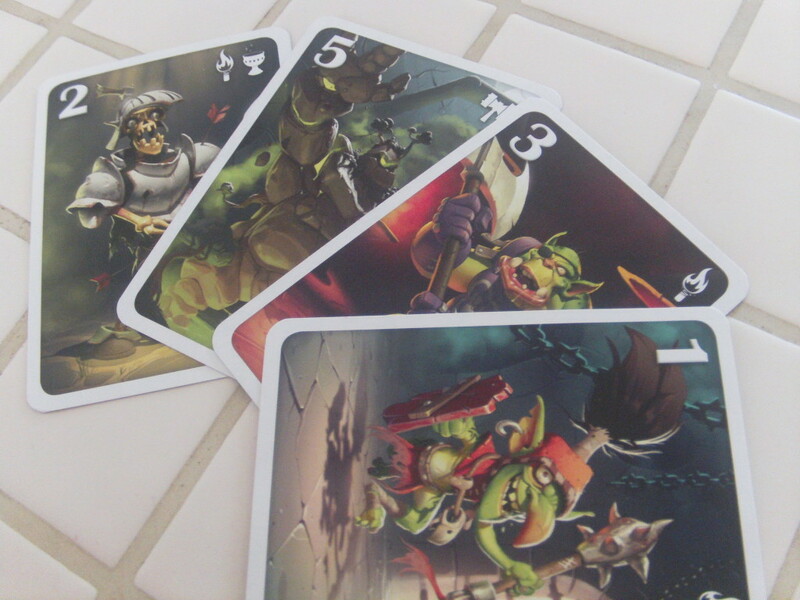 Each of the cards in the deck depicts a specific monster that has a certain strength (a number) and lists a particular piece of equipment that will instantly kill it. If they draw a card, they can either add this monster to the Dungeon that this particular adventurer will brave, or they can place it face down in front of them and remove a single piece of equipment from the adventurer. Once all the players except for one have passed, that player must take that adventurer (and whatever equipment they have left) and go into the dungeon filled with all the monsters that players have added over the course of the round. How much stuff will you be able to take into the dungeon? You see, each adventurer has a total of Health Points that are an accumulation of health that they get from the character themselves and from certain pieces of equipment. 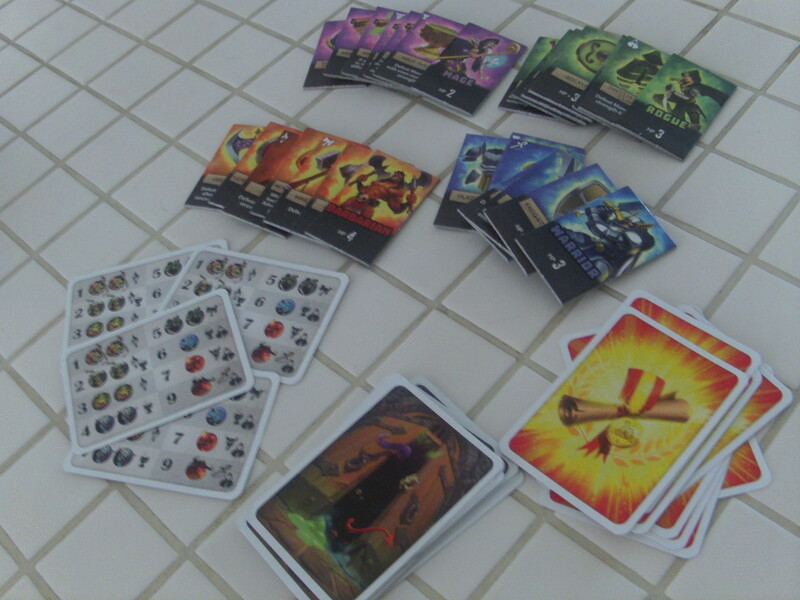 When a player takes an adventurer into a dungeon, they flip each card in the dungeon over in the order that it was played. If the adventurer does not have the piece of equipment that instantly kills the monster, they subtract the strength of the monster from their health. If the adventurer makes it past every monster that has been put in the dungeon, they receive a Scroll of Success. If the adventurer doesn’t make it through the dungeon intact, that player fails. Fail twice and you’re out of the game. 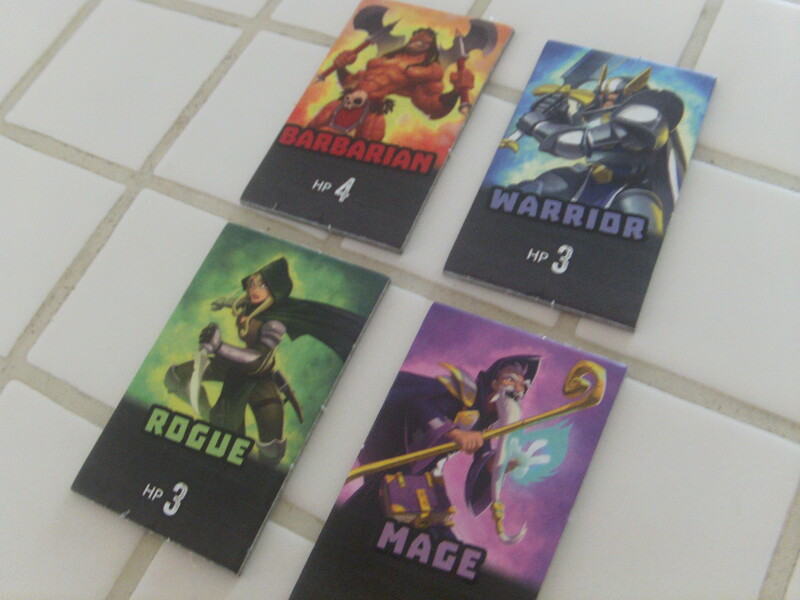 Win two scrolls (or be the last player left) and you win! What results of all of this is a deceptively tense game for such a small box. Do you add that monster to the dungeon, or do you keep it out and sacrifice a piece of equipment? If you do keep it out, which piece of equipment do you choose? Inevitably, a player will remove a piece of equipment that every other player will think of as integral to that adventurer’s survival. Soon this unlucky player will hear a chorus of “Pass. Pass. Pass.” And then have to take their sorry excuse for an adventurer into the dungeon, kicking themselves for their decision. But what makes Welcome to The Dungeon great are those moments when someone thinks that they are absolutely screwed, but they make it through anyway. Every player will look at each other in amazement, scarcely able to understand what just happened- and what seemed like inevitable defeat will turn into sweet, sweet victory. This is a game that will involve much cursing- but the good-natured kind, the kind that is done through a rictus of a smile shared amongst friends. I should mention that the art on the cards is lovely and fits the fun theme of the game quite well, without straying too far into the realm of “serious gaming”. There isn’t a lot to this game, but then again, there isn’t a lot needed in this game. Take it with you in your backpack or purse and pull it out when waiting for a table or for a connecting flight. You’ll have some fun with some friends and people around you will want to know what this game is and how to play. So for all those reasons, A Space Ahead recommends Welcome to The Dungeon– just try to keep the swearing to a minimum when in public.